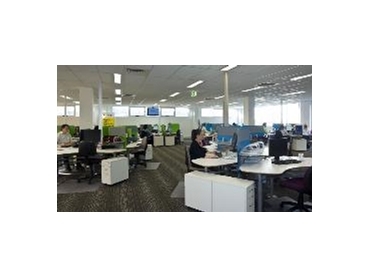 A corporate office and customer service centre was built recently on Signet warehouse site in Brisbane’s east to improve Signet’s customer service. The national safety and packaging supplies company moved into their new building in April, enabling better customer service by bringing staff into the one building after a year of temporary accommodation. According to Mark Brennan, Managing Director, Signet, Signet staff now have a modern, light and fully accessible building from which to conduct business. The new building means access to internal resources and personnel is vastly improved, with much better amenities such as meeting rooms, staff facilities, phone systems, natural lighting, and colour-coded open plan work stations. Recently Signet had been recognised as one of Australia’s leading customer service providers, having been accredited with International Customer Service Standards (ICSS: 2003-2006). Signet’s service culture goes all the way through the company, from training and personal development of staff, to the way they run the business and accounts, and the leading customer ordering systems which provide a transparent, quick and seamless ordering experience. Signet also have two other warehouses on the eastern seaboard (Townsville and Sydney), and is planning further expansion into Melbourne. Signet’s sister company, national labelling business Insignia, also shares the new office and warehouses at Wakerley.